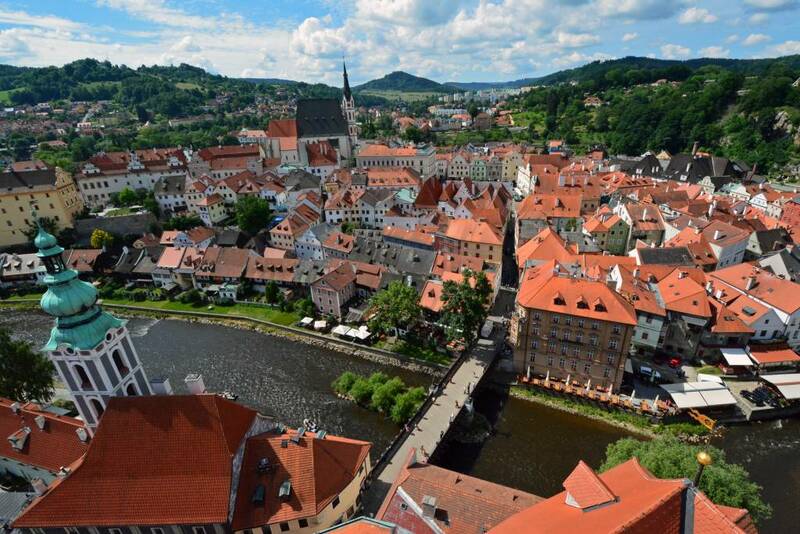 Cesky Krumlov is a charming small town located in the Czech Republic about 2.5 hours from the capital city of Prague. We arrived via private transportation with Czech Shuttle (you can also arranged an even more affordable option by using their shared shuttle service.) Though most people just visit for a day or two, we spent 5 full days in this beautiful village, but felt like we could’ve stayed much, much longer. 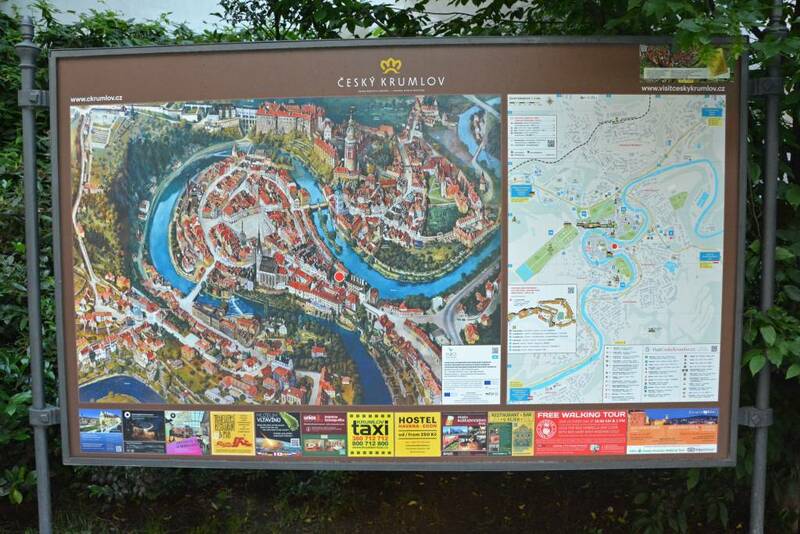 A UNESCO World Heritage Site since 1992, Cesky Krumlov is steeped in rich history. The construction of the town and its castle commenced in the late 13th century. 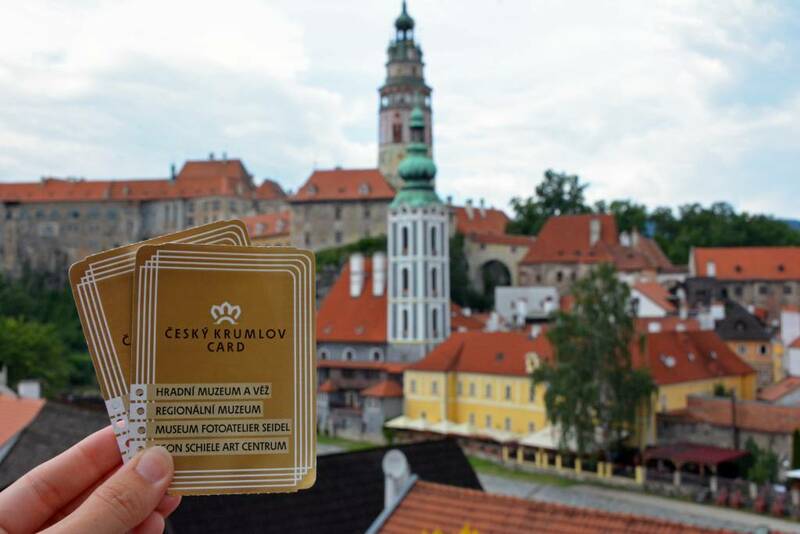 To make the most of your stay in Cesky Krumlov, stop by the tourism office in the main square and purchase a Cesky Krumlov card for a nominal fee. This card includes entrance to 4 museums: Castle Museum and Tower, Regional Museum, Museum Fotoatelier Seidel, and Egon Schiele Art Centrum. 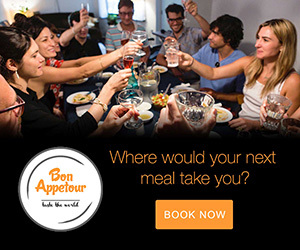 Save over 50% off of the regular ticket price. 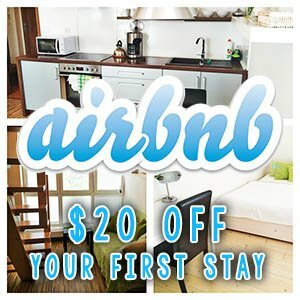 Stay at a local participating hotel for 3 or more nights and the card is FREE (even more incentive to stay longer than just a day or two!). With a quaint town center, and less than 9 square miles total, everywhere you turn, there is a colorful building, monument, or structure with a fascinating history. 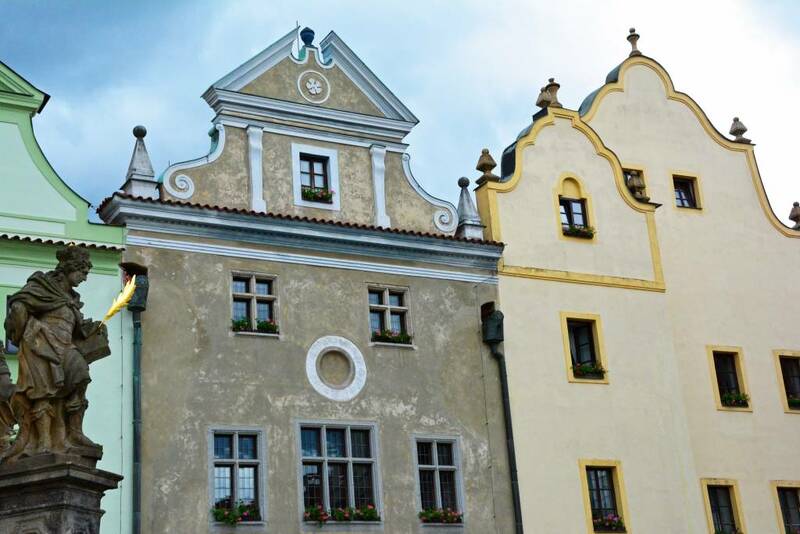 Gothic, renaissance, and baroque style architecture can be found throughout the town. 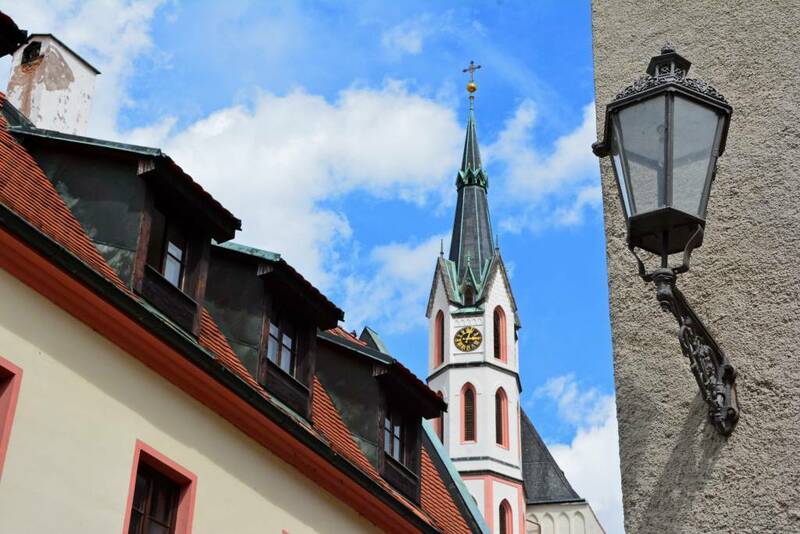 The steeple of St. Vitus Church dominates the skyline in this tiny town and can be seen from pretty much every vantage point. Although there are several noteworthy churches throughout the Czech Republic, we found it interesting to learn that they are the least religious population in the world, with barely 10% claiming a religion. 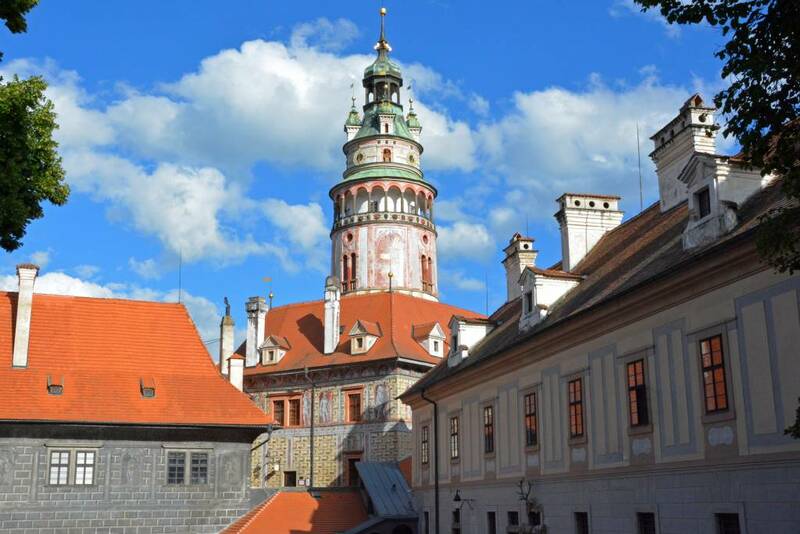 Besides the church, the other most notable landmark in the city is the castle, which is unusually large given the small size of Cesky Krumlov. 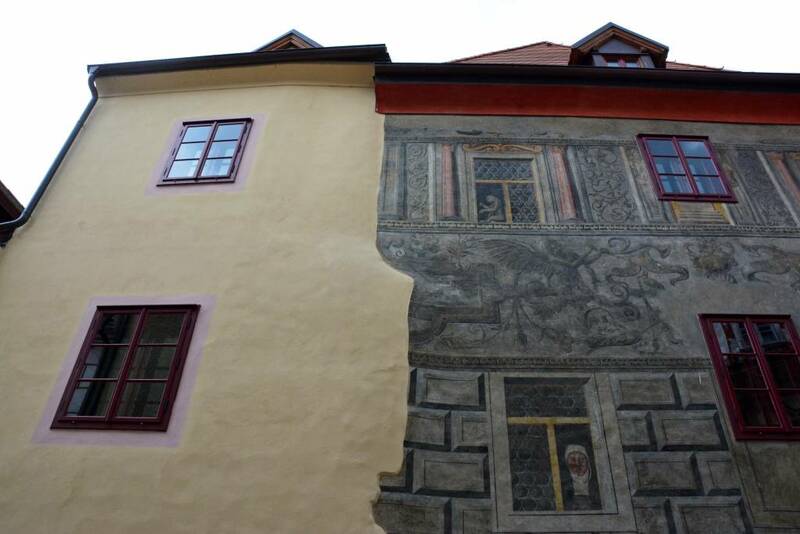 It is second in size (in the Czech Republic) behind the castle complex in Prague. 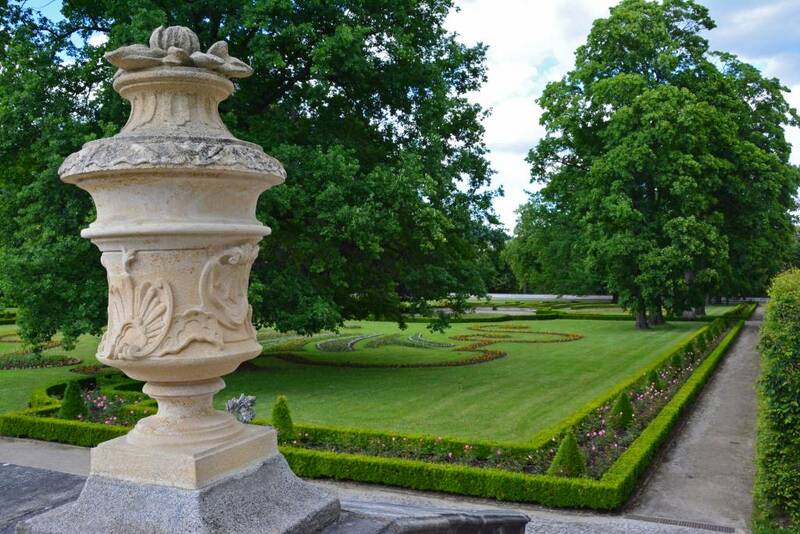 The castle gardens are an attraction all their own, so they deserved their own write-up. 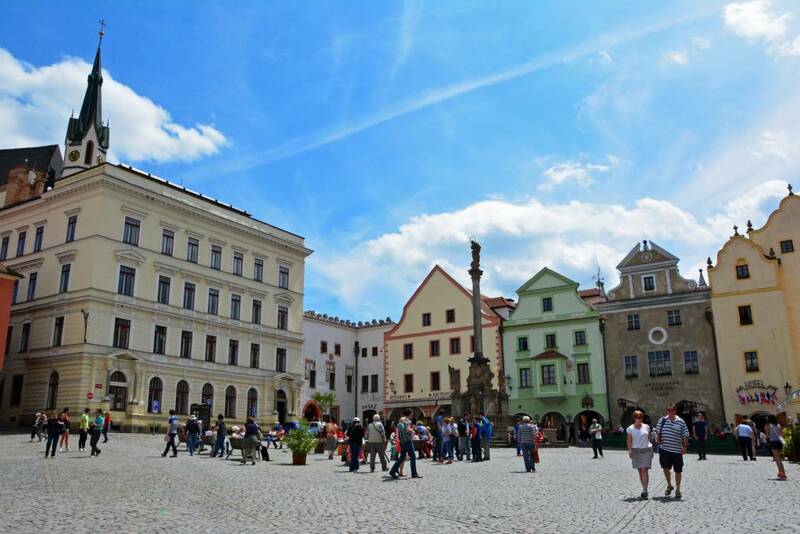 The history, culture, cobblestone streets, and general charm of Cesky Krumlov is what attracts visitors from all over the world. 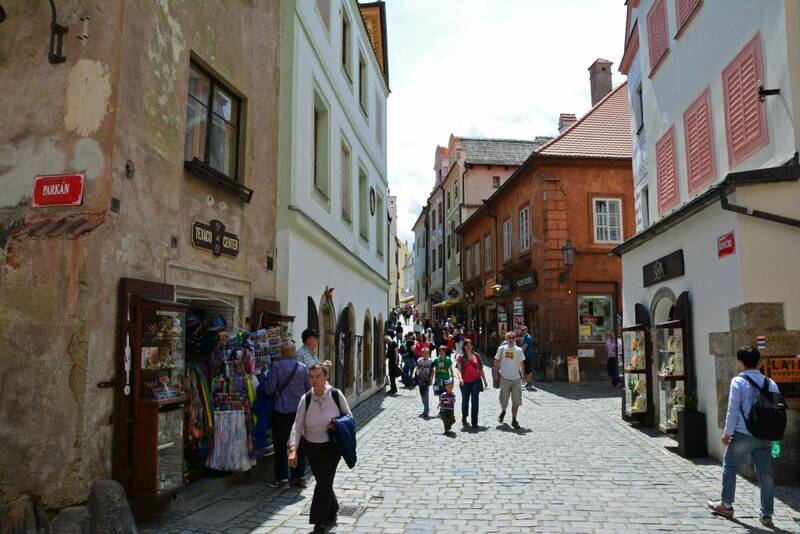 Restaurants, cafes, galleries, and shops line the main alleys, providing refreshment and authentic souvenirs to the thousands of travelers who make their way to this adorable small town. 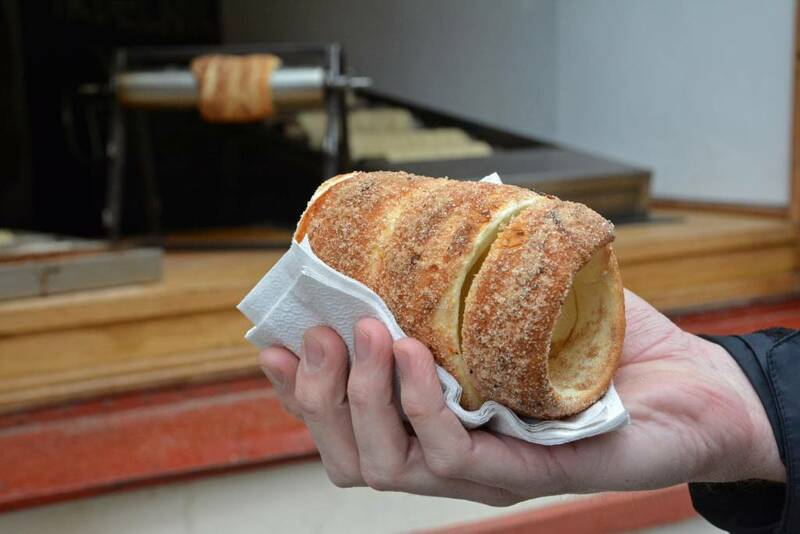 Be sure to not miss out on trying a trdelnik during your visit to Cesky Krumlov. This delicious pastry is traditionally from Slovakia, but can be found throughout the Czech Republic and a few other eastern European countries. They are best enjoyed while hot and fresh, and are served with a dusting of cinnamon, sugar, and nuts. For an extra indulgence, try one with chocolate or Nutella inside! Besides the buildings, shops, and other attractions, another aspect of this village which we appreciate is the sense of adventure and nature that it provides. With a river running through town, you can rent a canoe, kayak, or raft and navigate the mild waters! 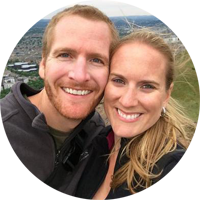 We took part in this popular activity, and while we didn’t participate in a multi-day rafting trip, we thoroughly enjoyed our brief journey from one end of town to the other. 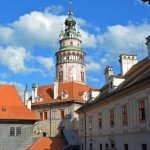 And, as we wrap up this post, we’d be remiss if we told you all about what to do and see in Cesky Krumlov without recommending a few places to eat! 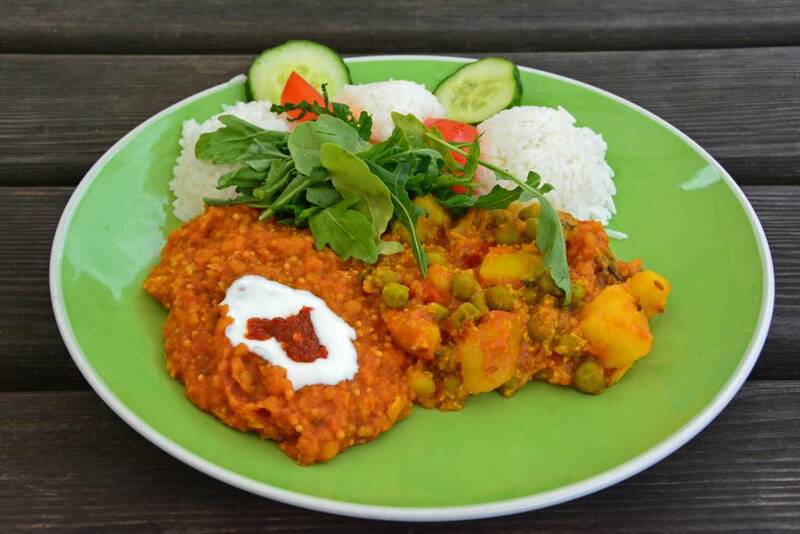 Laibon is one of a few vegetarians restaurants in town, so after several traditional heavy Czech meals, you might be ready for lighter fare. Located along the waterfront just under the castle, it is the perfect place to enjoy a delicious meal and watch the rafters go by. 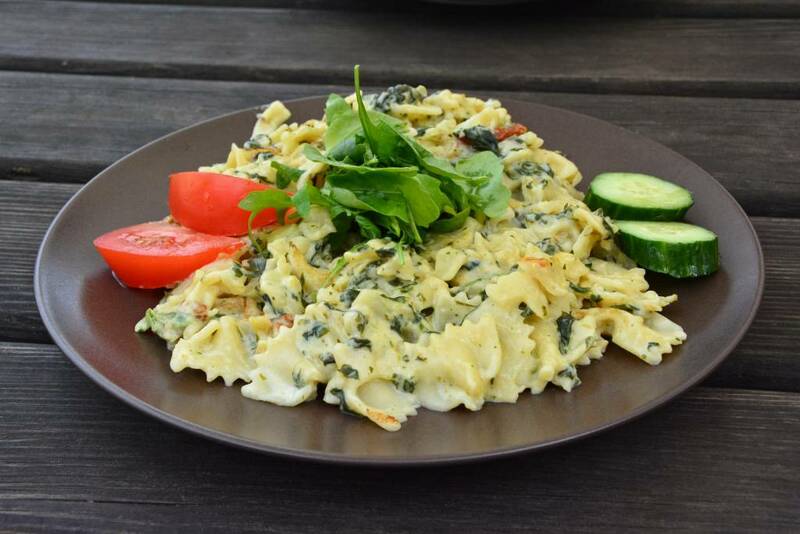 … and I indulged in a scrumptious serving of pasta with cream-cheese sauce, walnuts, sun-dried tomatoes, and spinach! 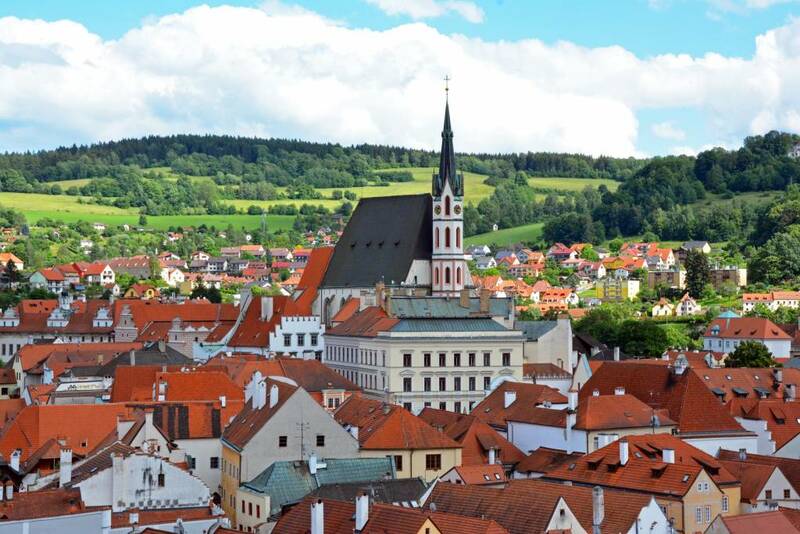 With so much to do, see, and eat jam-packed into this tiny town, be sure to add Cesky Krumlov to your itinerary when planning your next trip to central/eastern Europe. It’s one of the most charming and affordable destinations in Europe! 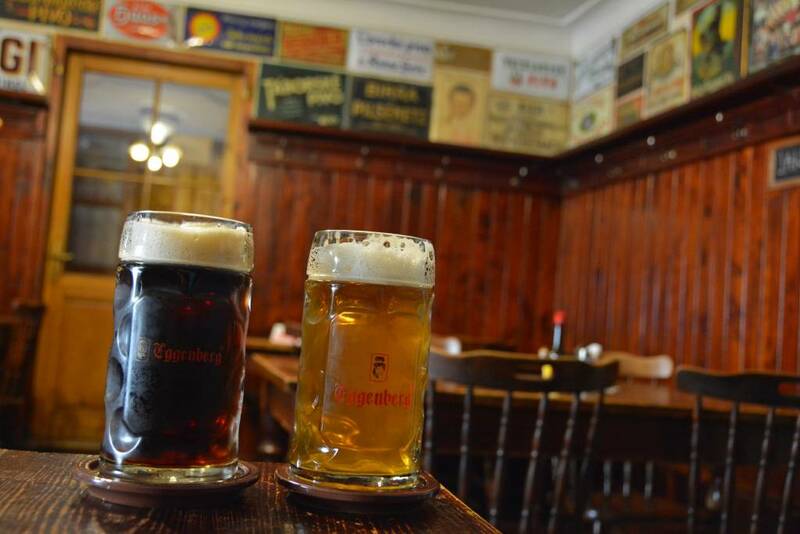 For example, we rented an entire apartment through AirBnB for less than $60 USD/night, and the beers… they were less than $2 (USD) each! Thank you! It’s a very photogenic town, as you saw in person. How neat that you stayed right in the middle of the town square. You are too funny! 🙂 Better than Silvertown! 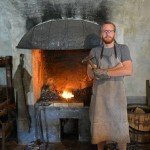 So much to enjoy here, from the castle (we love history!) to the trdelnik. I say yes please to a nutella one…. (but honestly it looks like a great place to visit). 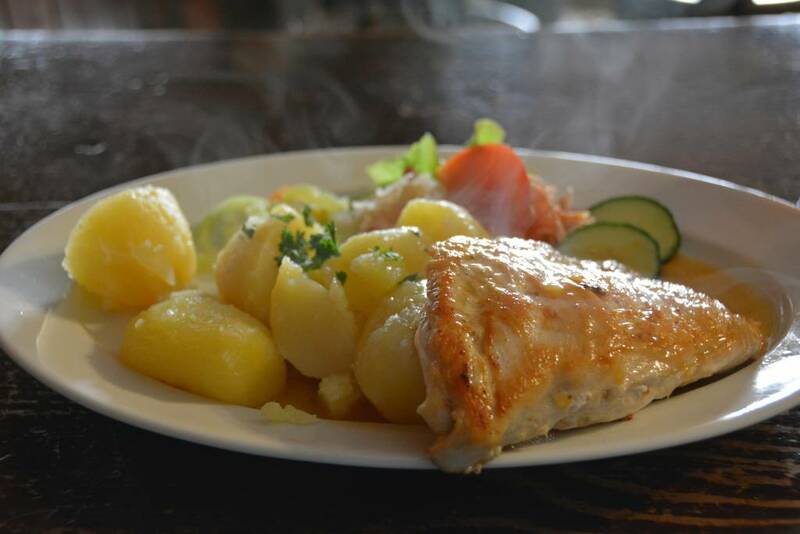 The trdelniks were so delicious… they’re almost always served warm and fresh, which is the BEST! What a picturesque little town! I would love to visit and I will be sure to include it in my itinerary when I next visit the Czech Republic. Thanks for the tip about the discount cards, very helpful! This town was perfect! Loved its charm! And yes, discount cards in cities are often a good idea! 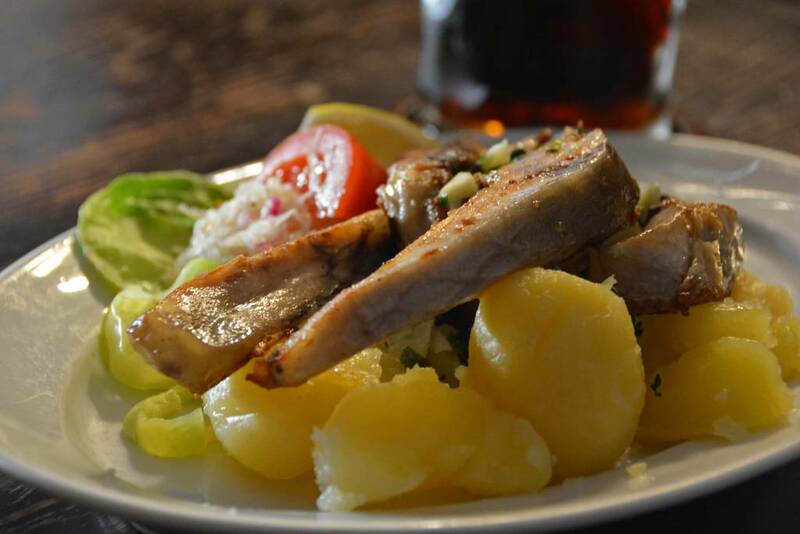 Um, is Czech food and beer the best thing ever or what? Your photos have my stomach rumbling, haha. Czech beer is definitely among the best! Absolutely charming! With that beauty, I definitely could have lived a week or two! Stunning photos too, I’m sure they translate well in real life. Happy travels, thanks for the visual treat! Thanks! We were grateful for pretty good weather during our trip that made the town look even more like a fairy tale! Wow! Your pictures (fabulous by the way) are the reason that the Czech Republic is my #1 bucket list destination! I cannot wait to see if for myself! 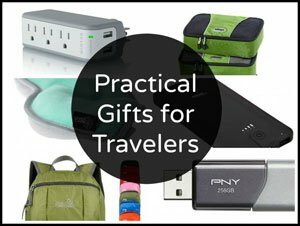 We spent 2 weeks there and easily could’ve spent way more! We are dying to get back and explore more! I have been to Prague but missed out on this gem of a town! Looks absolutely beautiful. I can’t wait to head back to Europe-wandering around small towns like this has to be one of my favorite things to do. Great photos by the way! Ours too! We LOVE small towns… and Europe is full of them, waiting to be explored! 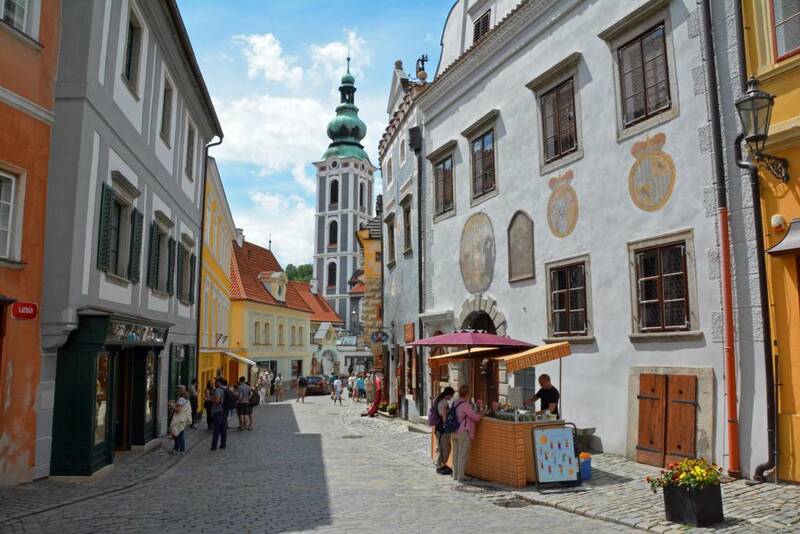 I love these medieval towns in Central and Eastern Europe. I am originally from Romania and in the region of Transylvania there are so many of these towns. 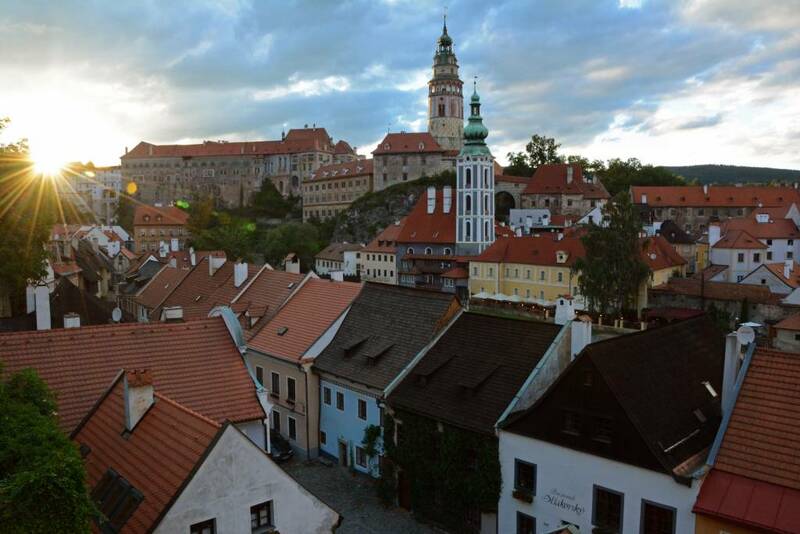 You have very beautiful pictures from Cesky Krumlov! Oooh! We must get to Romania one day! Transylvania looks gorgeous! Ah yes… figuring out transport ahead of time definitely reduces stress once you’re there. Yes, you should go there ASAP. It’s an absolutely adorable small town with so much charm and character. Awww, thanks Kimberey! 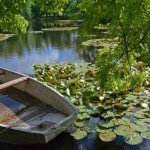 Yes, the Czech Republic definitely has some hidden gems. We can’t wait to get back and explore more! It’s so beautiful and affordable, you should try to visit ASAP! 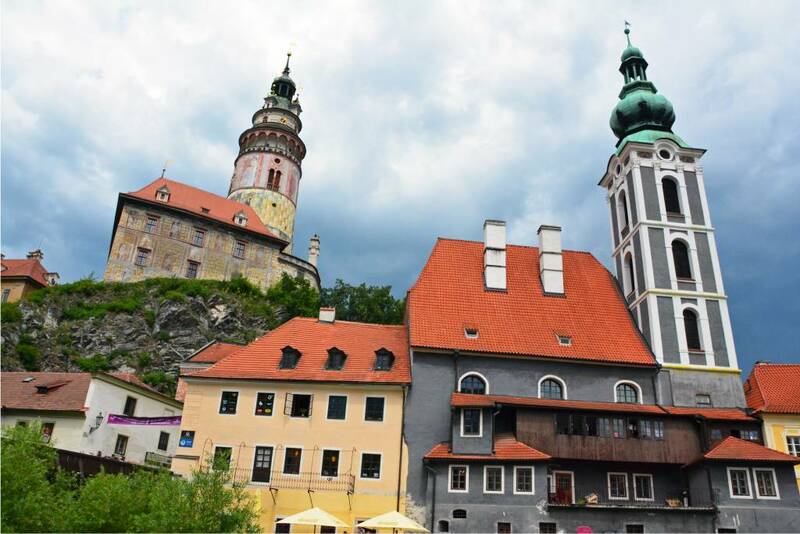 We loved Cesky Krumlov – it was very charming and super picturesque. We only stopped there for part of a day while driving from Budapest to Prague, but it was enough to want to see it again. It was nearly Winter when we went – it would have a very different feel during the warmer seasons as shown in your photos. We really enjoyed the Czech people, food and of course, the many many great and cheap beers!! 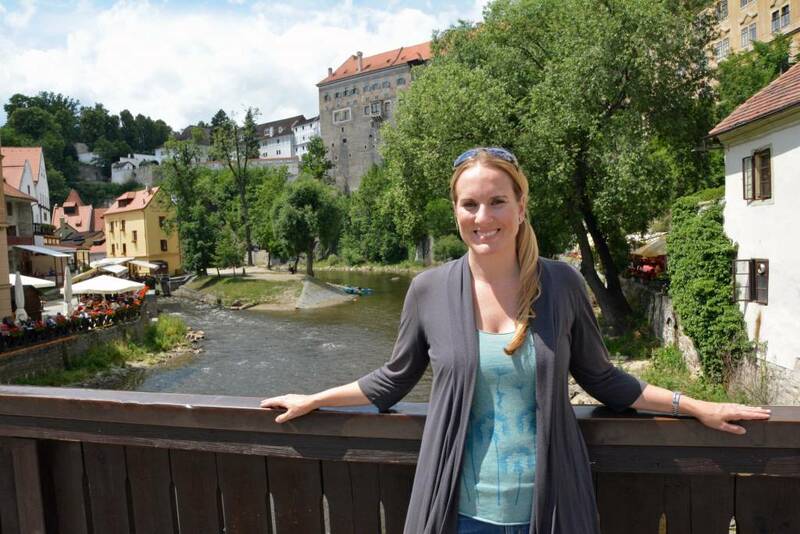 It’s hard not to fall in love with Cesky Krumlov! We did enjoy the town in the warm summer months, but we think it would also be fun to visit in the winter months, like you did! 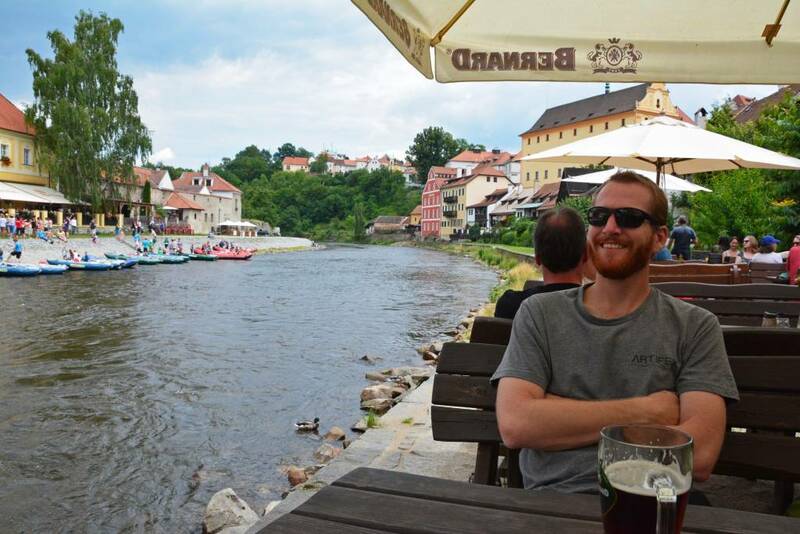 The people, the food, and the cheap beer – so many reasons to visit the Czech Republic! Nice. Thanks for ur information. Czech Repuplic is awesome and no its not true that majority of Czechs are atheists, they just dont believe in religious institutions. From what I read they have the highest rate of spiritually curious people in Europe around 60 percent visit tarot readers, astrologers and clairvoyants. Strong spirituality is what helped all Eastern Europe to overcome and endure centuries of invasions and military abuse. Healing with herbs and prayer is very common in Czech Republic and many other countries like Slovakia, Bulgaria and especially further in Russia. Thanks to King Charles IV Prague is one of the greatest spiritual centers in Europe.